COUTURE BRIDAL PHOTOGRAPHY CAPTURES ALL THE MAGIC ON YOUR PUERTO RICO DESTINATION WEDDING AS THE TOP RATED WEDDING PHOTOGRAPHER FOR SAN JUAN PUERTO RICO DESTINATION WEDDINGS! Capture all the passion, history and excitement of Puerto Rico with a destination wedding in San Juan, the cultural capital of the Latin Caribbean. Founded in 1521, this may be the second-oldest European city in the Americas, but inside the towering walls surrounding Old San Juan flows a vibrant cultural that’s eternally youthful and energetic. If you want a wedding celebration flavored with some spicy salsa—not to mention merengue, danza, plena, bomba, and the cha-cha—Puerto Rico’s passion for dance is matched only by its love for indigenous food and drink, from the rustic roast-pork dish known as lechon to the endless takes on the plantain-based mofongo. And, of course, no Puerto Rican wedding reception would be complete without a toast featuring the island’s famous rum: Bacardi, Don Q, or lesser-known favorites like Ron Barrelito can provide the key ingredients for a signature wedding cocktail. The proximity of Old San Juan to some of Puerto Rico’s best beaches means your destination wedding can incorporate the familiar Caribbean themes of beach, sand, and sun as well as featuring San Juan’s historic architecture, such as the famous El Morro fort, as the backdrop for unforgettable photos. As for reception sites, you can go seaside at the Caribe Hilton—welcoming guests to the island since 1949, when it became the first Hilton outside the U.S.—or the polished and restored Condado Vanderbilt Hotel, a beachfront landmark since 1919. In the heart of Old San Juan, the Hotel El Convento marries the intimacy of a luxury boutique hotel with a historic setting of a former convent that’s within easy walking distance of El Morro, the National Gallery of Puerto Rico, and other attractions. Old San Juan can also host a larger affair: the Antiguo Casino is an elegant Spanish-French design landmark where up to 350 guests can dance on white marble floors lit by glittering chandeliers and dine on cuisine prepared by noted chef Pablo Budet. Location: 100 Calle del Cristo, San Juan, 00901, Puerto Rico. 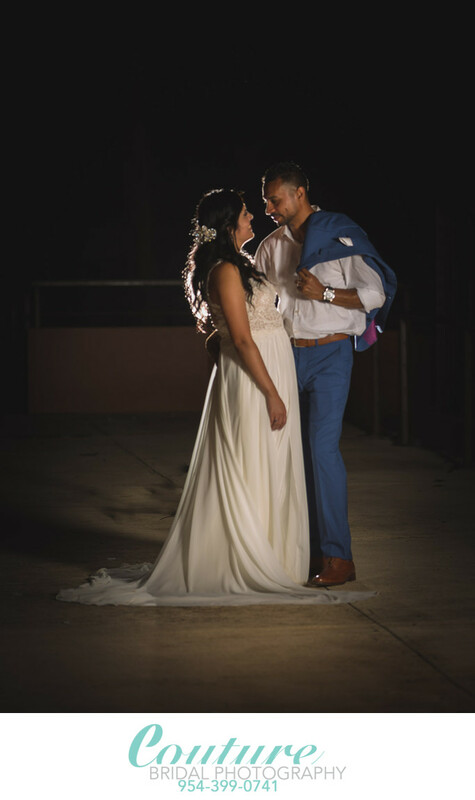 Keywords: bride and groom (198), Hotel El Convento (3), Puerto Rico (39), Puerto Rico Destination Weddings (21), San Juan (33). 1/60; f/2.8; ISO 100; 145.0 mm.